It’s always a legitimate question to ask whether or not a photograph is telling the truth. This photograph was captioned by Time magazine on April 29, 2013. It is reproduced here from Hariman and Lucaites’ No Caption Needed. The photo was slightly enhanced but apparently within journalistic limits.The original caption had an incorrect date and location and although such mistakes can be important it is not my concern at the moment. You can see, however, that there are additional issues at stake. If you look closely the man being restrained by the police is rubbing his eyes and the one soldier is holding a spray can and pointing it toward him. The restrained man apparently resisted and the soldiers resorted to spraying something in his eyes. You can actually see a small cloud of the spray coming from the canister. Every time I see one of these photographs I’m reminded of the Eddie Adams photograph of the Saigon chief of police holding a gun to the head of a Vietcong and about to pull the trigger. You can see it here. This is a Pulitzer prize-winning photograph. Regardless of what you think of the picture it is a powerful and compelling moment that communicates the tension and anxiety just before the instance of having your brains blown out. 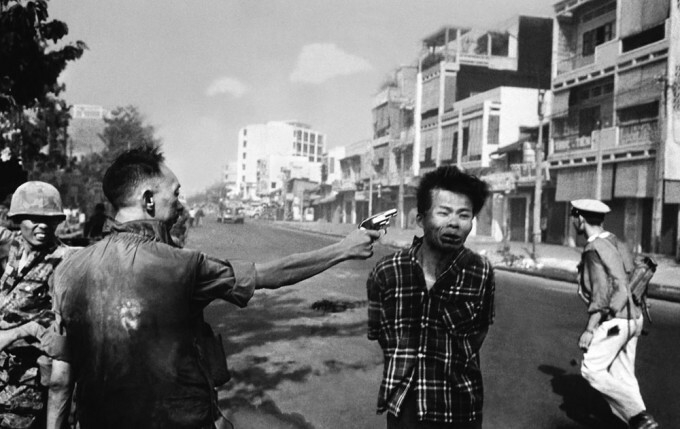 The photograph has been associated with lawlessness and the street justice that took place during the Vietnam War and rightfully so. But the man who was shot was a known Vietcong sympathizer who apparently had committed violent acts of his own and was far from innocent. Again, I am not in any way defending the street lawlessness portrayed in the photograph but it is helpful to know what happened immediately before the moment of the photograph. Israelis often complain about a lack of context or understanding about what preceded an Israeli military incursion and that using tanks as weapons is usually a response to earlier aggression rather than an initiative. It is typical for newspapers around the world to show for example an Israeli tank destroying a house and leaving it at that – with the conclusion that Israel is engaging in excessive force. The Israelis are always chagrined at how no one asks who was in that house and what preceded the tank attack. It’s a matter of context. We might ask the same question about the fellow rubbing his eyes and the soldier holding a spray can. 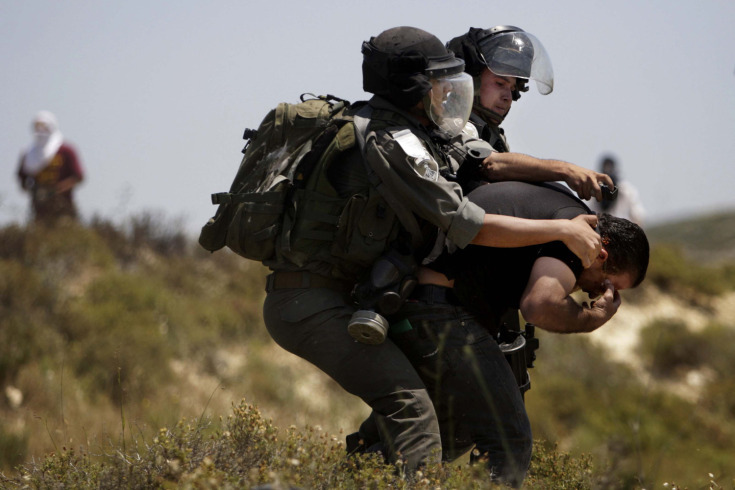 I presume the soldiers are trying to disable the man so that he is no longer a threat.The caption for this picture could have read “Israeli police pepper-spray protester” and directed attention to perhaps improper behavior on the part of the police. Or, the caption could have read “man being arrested” and framed the protester as a criminal. Lucaites and Hariman (see No Caption Needed link above) elaborate on the role of captions by pointing out that they can tell you what to think about as well as tell you what to ignore. Moreover, it’s interesting to note that this photograph is typically cast as an Israeli “peace image.” Such a classification equates peace with security which, on the one hand, is consistent with the Israeli sense of existential threat that it lives with on a daily basis. Yet, it is not an image of a warm peace rooted in cooperation and mutuality. Images are powerful and persuasive. The public often forgets that images are designed for particular audiences on the basis of the message they express. Sometimes these designs are highly calculated and represent strategies to reinforce or create new attitudes. The role of images in the peace process – the strategic role – remains reasonably unexamined. There are, for example, moral questions that still challenge the best practices of using photographic images. Posted on June 10, 2013, in Media and politics and tagged Journalism, Media, Photography. Bookmark the permalink. 2 Comments. There is an extensive literature on this in photo theory.With reference to israel-Palestine, you might look at Ariella Azoulay’s The Civil Contract of Photography.. I found this to be a very interesting piece. I have never really thought to question photographic integrity, whether the photo is telling the truth. Journalistic integrity, yes, but not photography.